In Penny Byrne I heart Nauru (2017) one of Byrne’s repurposed porcelain figure the wistful girl seated on a rock has sewn her lips together and has slashed her legs and arms, self-harming in despair. Byrne is also a ceramics conservator and uses the same conservation techniques to alter mass produced kitsch ceramics. She gives them a new political meaning with the judicious application of enamel paint. I feel that I have failed as a critic this year because I did not write about “All we can’t see – Illustrating the Nauru Files” at Forty-Five Downstairs in August. Byrne’s figure was just one of the exhibiting artists in that exhibition. I wanted to address the deep systemic problems in Australia that have lead to this, however at the time I felt the pain depicted in the art too much and lacked the energy to write. The Australian concentration camps are not the responsibility of one political party but are symptomatic of a deep lack of morality. 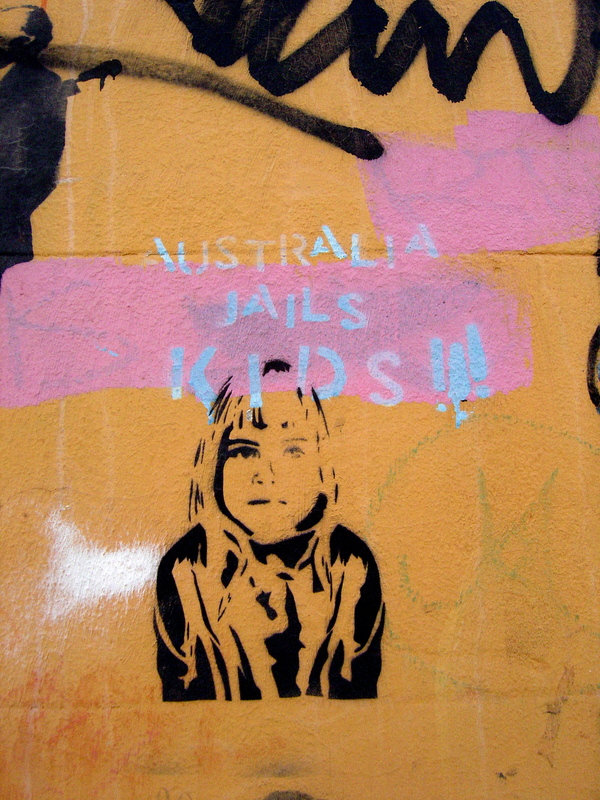 There are so many examples of institutional child abuse, war crimes, genocidal activity in Australia’s recent history that all the apologies in the world cannot disguise the fact the country is amoral. The cause of this Australian amorality is that either the majority of Australians or basic the structure of Australian politics is or both. At the foundation of this structure is the Australian constitution; a document without any protection of civil or human rights, a document that permits voting laws to be made on the basis of race. However the Australian constitution cannot be entirely to blame, it is merely facilitates a system without a conscience. Nationalists consider that it a good thing for the subject of Australia’s criminality never to be raised. Denial, distraction and ‘no comment’ are the national character of a criminal state. You cannot have a civil debate when one side does not want to have one. Criminals charges must be brought against all those who participated in these crimes; only following orders, only doing your job, even only obeying the law are not excuses for crimes against humanity. And the Australian constitution completely rewritten so that these crimes can never happen again. It is called the National Gallery of Victoria for obscure historical reasons but it is the nation of Australian and Australian nationalists that are at the core of the problem. 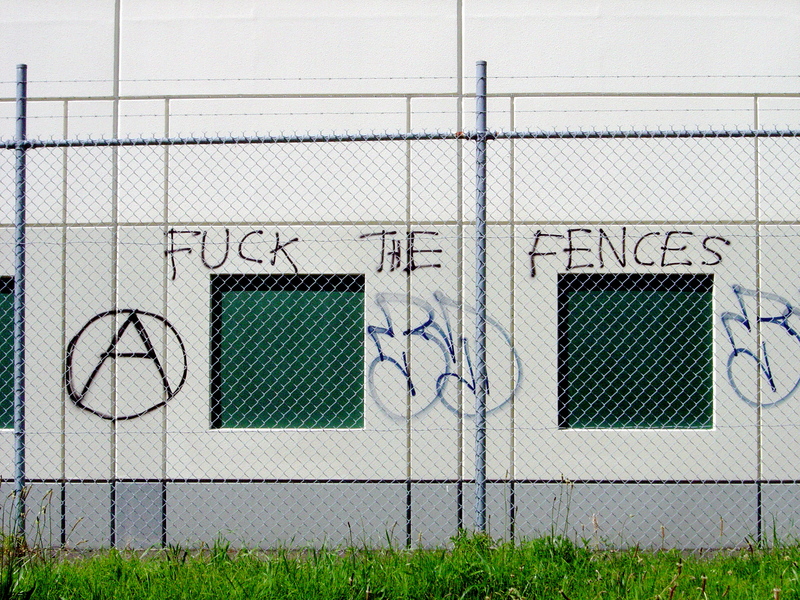 The protest at the NGV over Wilson Security demonstrates a deep divide in Australia. I believe that Wilson Security along with all members of the Labor, Liberal and The Nationals parties of Australia should be standing trial for crimes against humanity in the International Criminal Court in the Hague where an appropriate and independent court of law can determine their guilt or innocence after hearing all the evidence. Others believe that Wilson Security is a legal and legitimate security contractor and that there is nothing inappropriate to their legal employment anywhere. It is clear that Wilson Security cannot provide security to the gallery when they have committed crimes against humanity. They become a massive additional problem for security at the gallery. Protesters have already proved that Wilson Security cannot provide security to the gallery by colouring the NGV’s water-wall and moat blood red and veiling Picasso’s Weeping Woman. The Weeping Woman is an excellent focus for the protest because the painting is riffing on the image of woman crying in the window in Picasso’s Guernica; a painting is a protest against fascist aerial bombing of civilians on 26 April 1937 during the Spanish civil war but it could be in Yemen this year. I am sympathetic to all the mothers and their children at the NGV Triennial. To have something adult, intelligent and free that a young child will also enjoy is a rare combination that many a parent has wished for. The Triennial has been designed with both in mind. There is even parking for strollers outside the some of the spaces and many of the exhibits are very child friendly. It is the presence of so many children which makes the presence of Wilson Security even more offensive as the company has treated children and adults in a cruel, degrading and inhuman manner. I don’t how many parents with children enjoying the Triennial would have seen the horrible irony that a company that treated children and adults in a cruel, degrading and inhuman manner was providing security for the gallery. Some of them would believe in three word political slogans and send their own children to schools run by organisations with a history sexual abuse. Three artists in the Triennial; Rafael Lorano-Hemmer, Richard Mosse and Candice Breitz have signed a letter of protest. Breitz and Lorano-Hemmer renamed their works in the Triennial to Wilson Must Go and Mosse found another way to incorporate his protest into his video work. 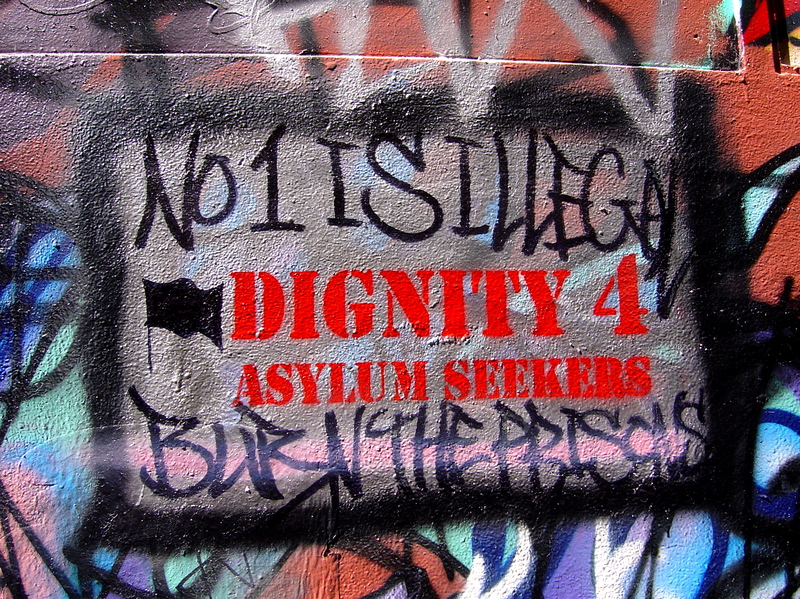 I cannot accept that a company that has committed crimes against humanity in running the concentration camps on Naru and Manus Island for the Australian government should be employed by an art gallery and would join with Lorano-Hemmer to encourage others to consider making a donation to: http://riserefugee.org/ and https://www.asrc.org.au/. Examining ethics of the boycotting the Sydney Biennale and the reply from the Board of the Sydney Biennale to the calls for a boycott. If you need a background on the issue see the links on Leg of Lamb. Attempting a utilitarian argument the Biennale’s board believe that their show is more important than the lives of refugees fleeing persecution only to be persecuted by the Australian regime. They can’t admit that the Australian government and Transfield have and will continue to commit crimes against humanity. They claim ambiguity when they are participating in distorting the facts about their association with criminals. It when they used the word “loyalty” exposing that their sense of duty is based on patronage rather than morality; loyalty, like patriotism, is the last refuge of the scoundrel. The threat of the Biennale ending is an empty threat and only threatens their status. It is the equivalent of saying that if you don’t buy SodaStream then you and your friends won’t enjoy sugary carbonated water. If the Biennale ceases to exist then another biennale will take its place in a few years, if a biennale was really needed by the hundreds and thousands of people, as the Biennale’s board claims. When in 2003 Nelson Mandela refused to have dinner with George Bush and spoke out against him it was a symbolic action. It was not because Mandela thought that it would stop the invasion of Iraq but because he did not want to associate with an evil person. I would urge all Australian artists to follow the moral example of Nelson Mandela to avoid and speak out crimes against humanity rather than the amoral example of board of the Sydney Biennale. Just as Mandela condemned George Bush’s invasion plans Australia’s treatment of refugees is something that we should also condemn without reservation. We should condemn both the Liberal Party and ALP and hope that one day that all members of these parties serve time for their crimes in slightly more humane conditions than they hold refugees indefinitely in. We should condemn Transfield and the Biennale chairman Luca Belgiorno-Nettis without reservation and all people should avoid any kind of association with them even if this is only a symbolic action. 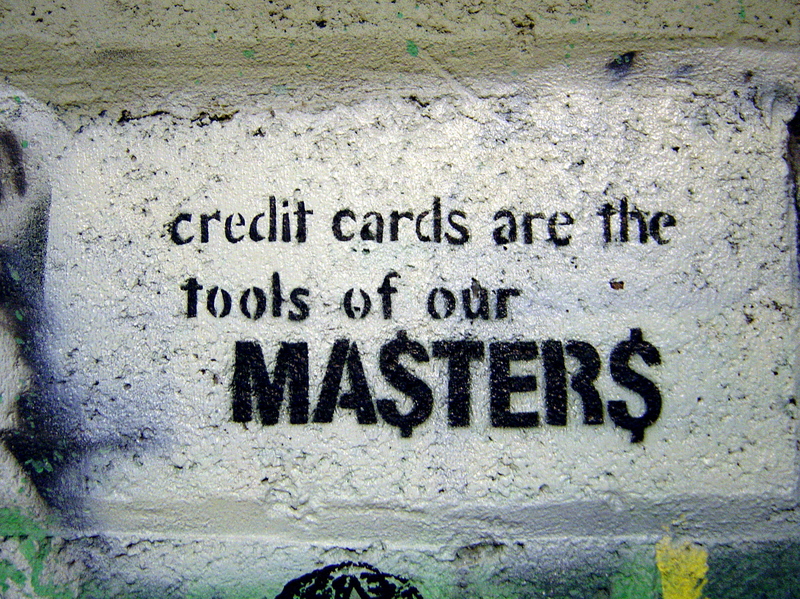 Artist, above all people, should understand the power and importance of symbolic actions for art is a symbolic action. Artists and the public should boycott the Sydney Biennale. Not only should artists and the public boycott the Sydney Biennale but they should picket it. I have to give credit to the artist Van Thanh Rudd for being the first artist to protest about Transfield’s links to the Biennale in 2012. Visitors to the Sydney Biennale need to be aware that they are giving aid and comfort to people who commit crimes against humanity. Who, besides its board and Transfield, really cares more about the Sydney Biennele than people’s lives and dignity? Refugee Action Collective (Vic) rally at State Library. Not that I think that any propaganda campaign of posters, fridge magnets and rallies can change the minds of the amoral psychopaths that dictate Australia’s crimes against refugees. I doubt that it will be any more effective than my rhetoric. 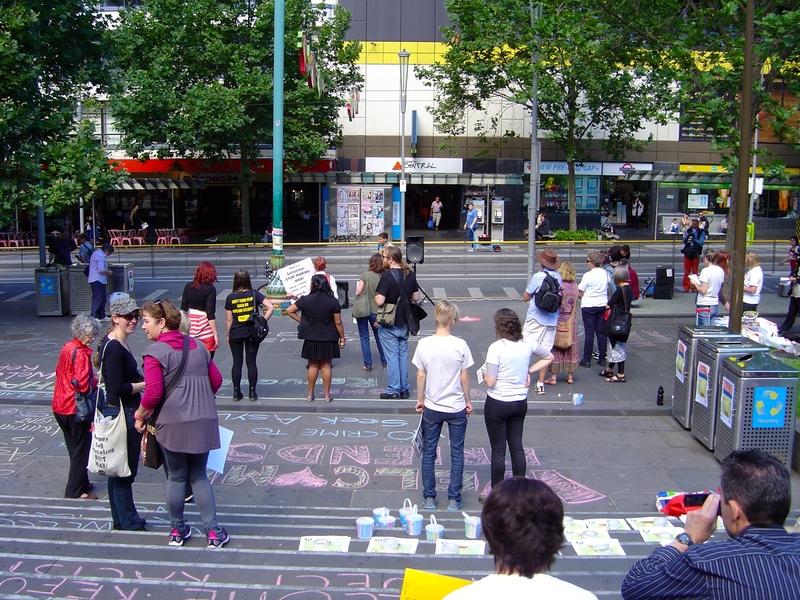 The Refugee Action Collective (Vic) was mildly calling for civil disobedience in encouraging people to “sticker, chalk your neighbourhood”. For yes, even writing in chalk is technically illegal in Melbourne; not that I’ve ever heard of anyone being arrested for it, not that the three police at the demonstration were making any attempt to stop people writing in chalk in front of the State Library. Not that many people were writing in chalk on Saturday morning. 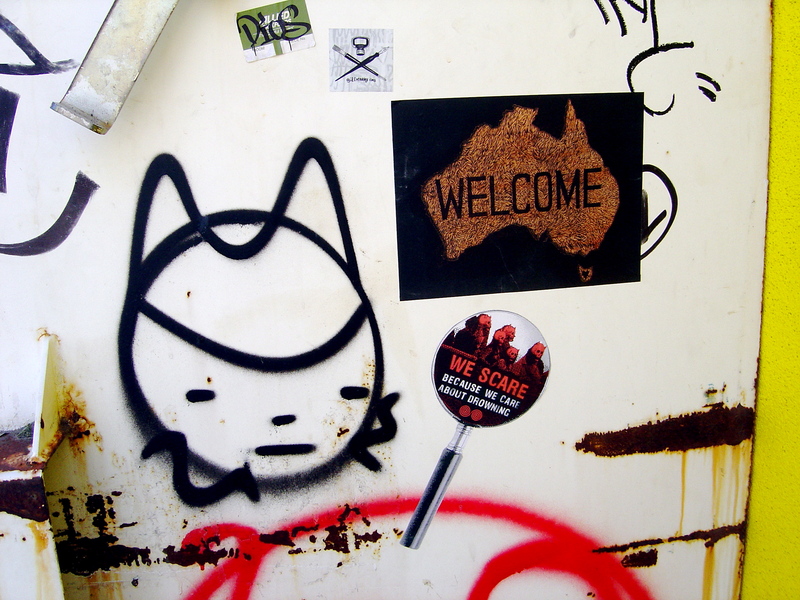 Melbourne’s street artists have been putting out the welcome refugees and showering the streets with more witty about Australia’s treatment messages for years. 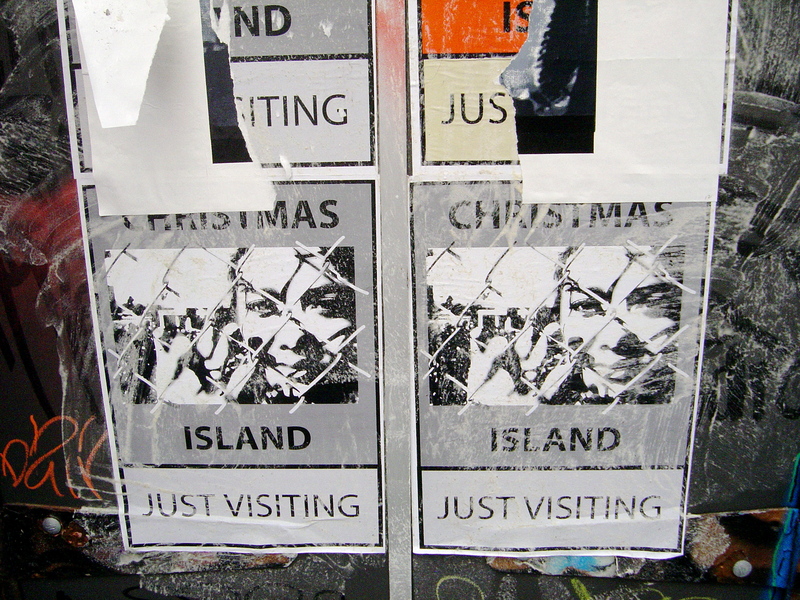 Of particular note, is Phoenix who has made the map of Australia into a welcome mat in a long running series of paste-ups. Phoenix sums up the both major parties position on refugees with the phrase: “We scare because we care”, a phrase that started with his paste-ups about the ‘War on Terror’. Phoenix is not directly involved with the Refugee Action Collective but his has donated some of his art to their fundraising auction. He is not a single-issue street artist and has been sticking his political art to Melbourne’s walls for years. Phoenix welcome mat sticker with Ghostpatrol tag. This sustained campaigns of illegal posters and stencils creates signs that the federal government and the opposition does not represent all Australians on this issue and is not in complete control of the territory it claims. 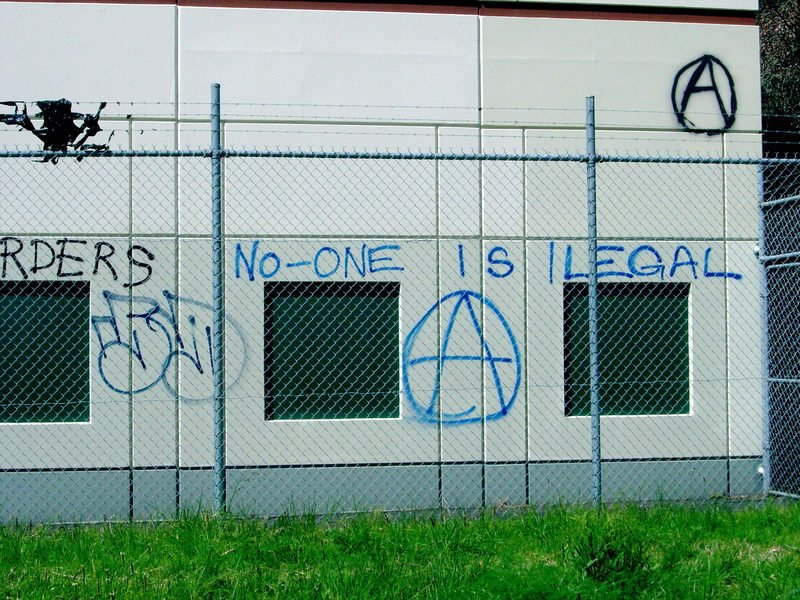 Even though it was buffed with in 24 hours I’m sure that my local member, Kelvin Thomson got the message when the external wall of his office in Coburg was recently covered in anarchist graffiti. I often find sociological exhibitions in art galleries to be out of context and poor art but Phuong Ngo’s exhibition “My Dad the People Smuggler” at the Counihan Gallery is long overdue and worth a visit. Currently in Australia the two major political parties compete to demonise ‘people smugglers’, the people who assist refugees to get to places of refuge, and to abuse those seeking refuge. The Australian government’s deliberately cruel, degrading and illegal policies on refugees (piracy is still a crime even if carried out by the Navy) have been going on for decades now. But back in the early 1980s in Australian policy towards ‘people smugglers’ was very different. Although Australia has long had an immigration policy that expressed racist xenophobia, the results of the Vietnam War lead to a brief period when refugees were welcome in Australia. It was during this period that Phuong Ngo’s father assisted others to leave Vietnam and arrived in Australia. The evidence that such things happened is in photographs and videos, including his father’s talking about his experience in people smuggling. Not that I expect that this exhibition will have any effect on Australia’s current policy on refugees; it is safely in an art gallery and will just contribute to the mixed messages that exist in our society. Michelle Hamer’s exhibition of small tapestries “I send mixed messages” is in Gallery One of the Counihan Gallery in Brunswick. The mixed messages are everywhere, as the Situationists loved to point out, the billboards, signs, stencils and tags all contradict each other. “Stop the madness,” reads a stop sign (stop me if you have seen this before). Clement Greenberg argued that kitsch was the inappropriate translation of art to the wrong media; I wouldn’t say that Hamer’s work is kitsch but I don’t know if the media is appropriate. As tapestries, the focus and much of the detail of the original photographs has been lost. I last saw Hamer’s work at Bus in 2010 but the work seems very familiar as there are a lot of artists creating needlework tapestry of urban scenes in recent years including Catherine Tipping, who will be having an exhibition of tapestries at Tinning Street Presents… later this month.